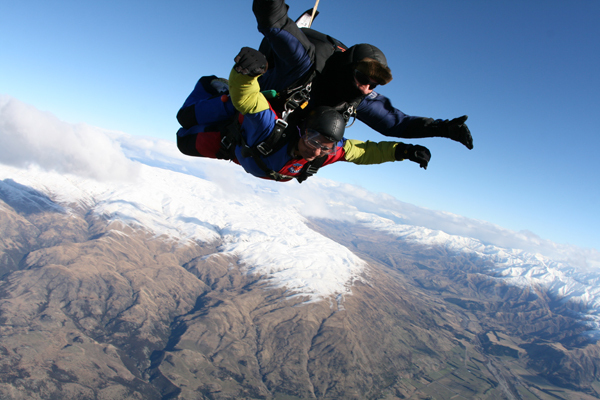 Last year around the same time – we were in Lake Wanaka, South Island, New Zealand – getting our first taste of adventure sports – hang gliding, aerobatics and sky diving. The inviting dare-you-to videos, the attraction of a once-in-a-lifetime opportunity, the desire to control your fear instead of being controlled by it, all led to the sign up. 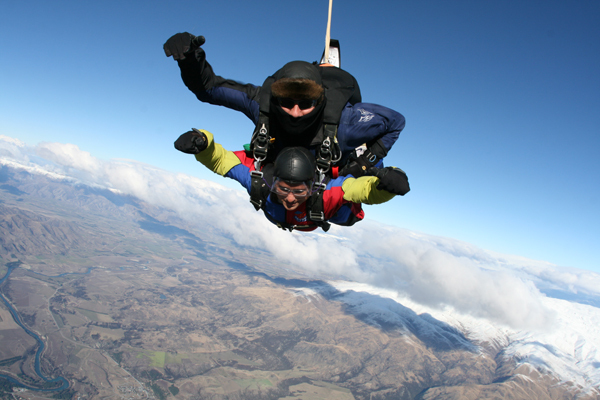 My younger son who was with us, staunchly refused to join in to this high-risk sport – he was very clear that none of the above reasons were worth the risk of death that it entailed. He would have done this if it were a necessity – but taking on the danger just for the thrill was just not something he was willing to do. So my 15 year old daughter and I went. 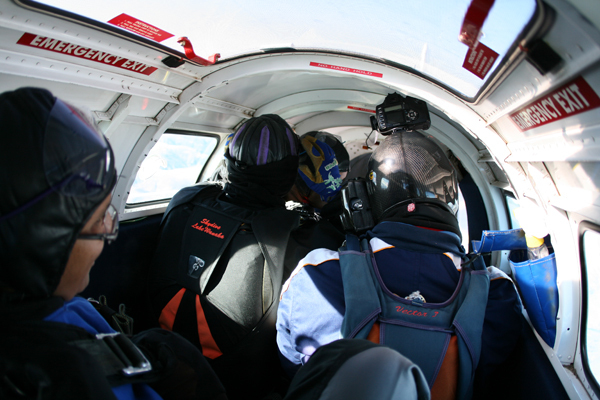 The trick I played with my mind was to block out all thoughts of jumping off as we taxied down the tiny plane – with the door open. 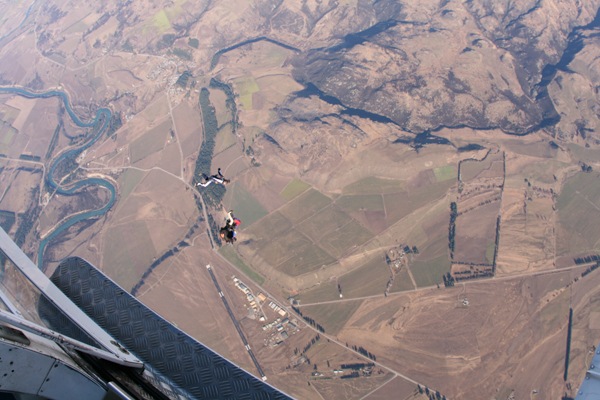 Strapped to the experienced tandem skydiver gave me confidence and I watched the landscape through the open door receding. It was beautiful, as long as I didn’t think about leaving the plane! Higher and higher, with the diver noting the height we’d reached. He gave me kinesthetic instructions – that I was sure to mess up on but it gave me something to think about and push out THE thought. And then it was time. My daughter and her tandem were to go first and we were to follow. I saw her slide to the door and watched her face full of fear – wish I had never ever seen that face! Watching the pain of your children always hurts infinitely more than that you experience yourself. Anyway I did not have much time to dwell on her fear for long…as it was my turn. We slid to the door. 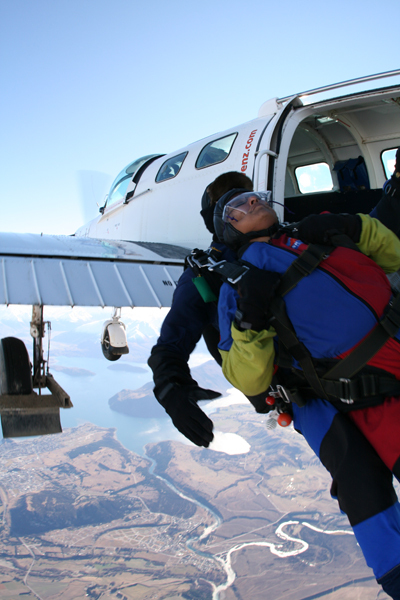 I held it with one hand with my legs hanging out of the door of the plane. At 15000 feet. This is the second time in life that I was feeling ‘faith’. In my tandem diver – that he knew what he was doing. I refused to believe that this was happening to me that we were sitting precariously in an unimaginable spot, about to do the worst imaginable thing in that spot i.e. to let go of the door instead of doing the obvious thing commanded by intuition i.e. holding onto any part of the plane for dear life. .I shut my eyes tight and forced myself to think of happy times in Goa. And we jumped. I didn’t mind if I died at that point because I was thinking blissful thoughts. 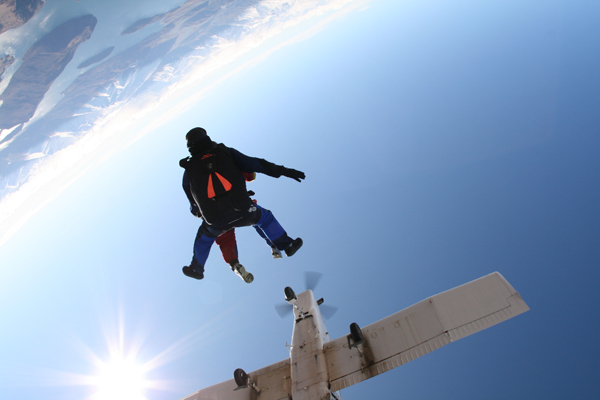 I had no cognition of the awful act of letting go of a perfectly fine plane and jumping out into emptiness.I have no memory of that moment as my eyes remained shut through those awful microseconds and thus cheated fear. The next thing I knew, we were horizontal – with our hands stretched out, facing the earth and enjoying the most spectacular adventure of my life. 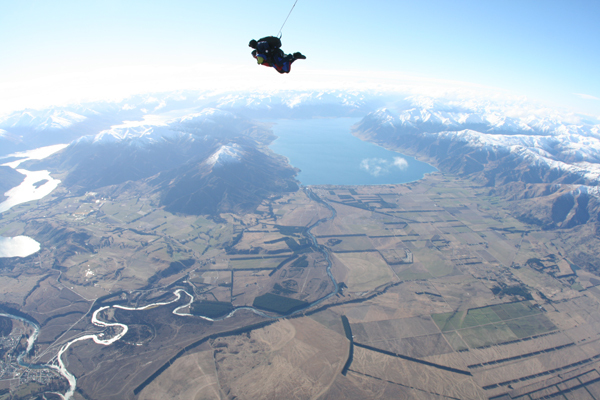 Free fall. For a whole minute. A minute that will stay imprinted forever. 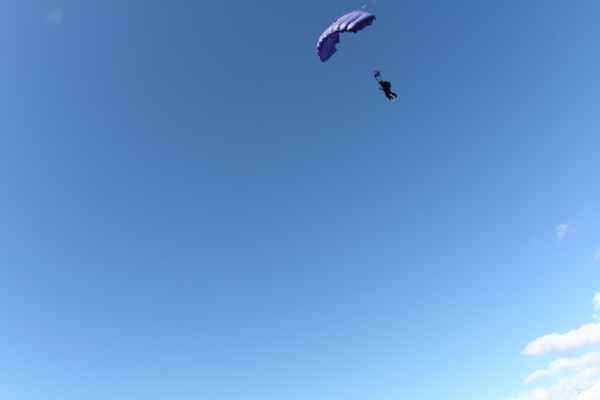 And then he pulled the string of the parachute. And suddenly, as a result we became vertical. Not half as much fun as it was being horizontal. We slowed down, the diver managed our manoeuvres expertly and we soon landed on earth as planned. 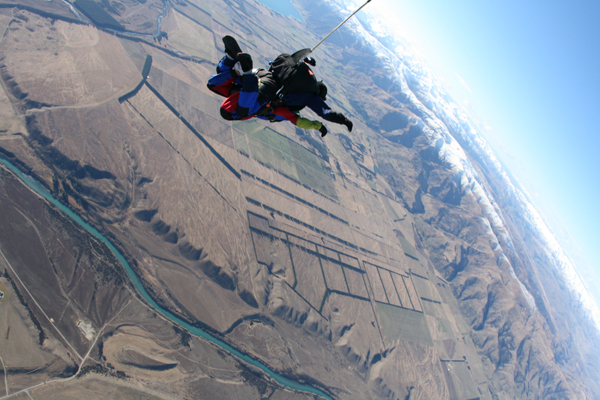 Adrenalin gushing, fulfillment gushing, greed-for-more gushing…..we were all hugging and grinning with supernormal delight at this other-worldly experience. 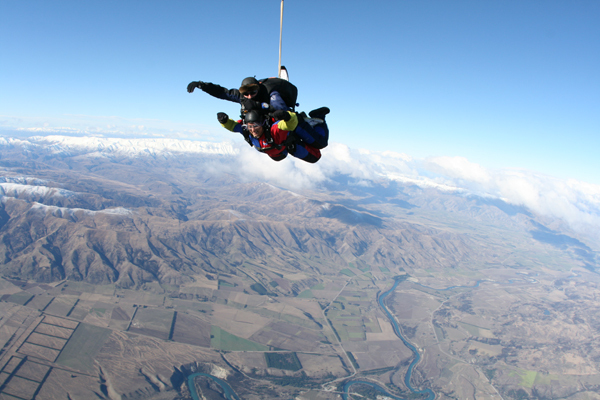 Free fall …..among the top 5 experiences in life! 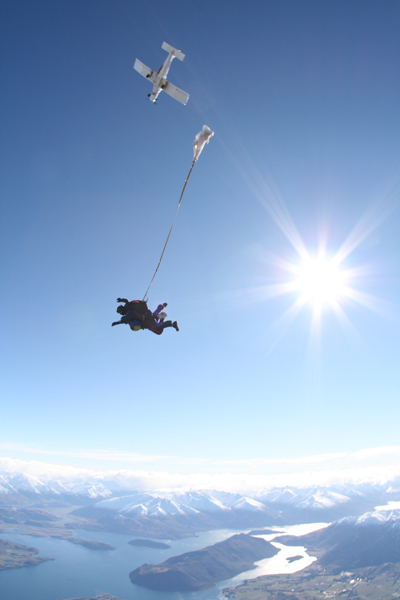 the parachute opens and we become vertical> Suddenly I could feel my weight. 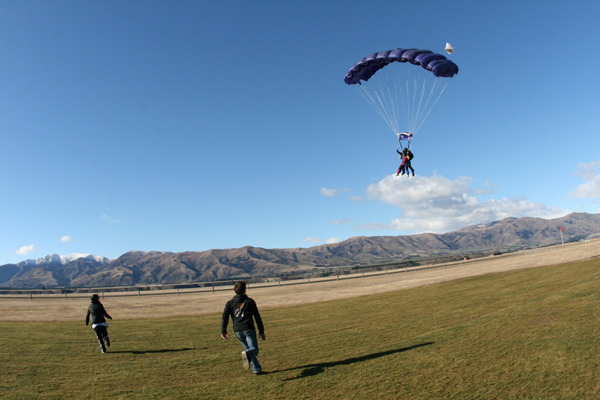 Today a plane crashed at Fox Glacier, South Island, New Zealand as sky divers set out to get their shot of adrenalin. It caught fire as it began taking off. It took me back to all our deliberations before we signed up for a similar thrill last year. We went in full knowledge of the risk involved. That risk we knew would be overcome by the expertise of all the providers involved. In case of tragedy, I would only be ashamed of the loss I would have caused to the people I left behind – a loss that would result from the selfish pursuit of my own free will and desire for thrill. My son would have been as angry with me – maybe more than he would have been sad about his loss. 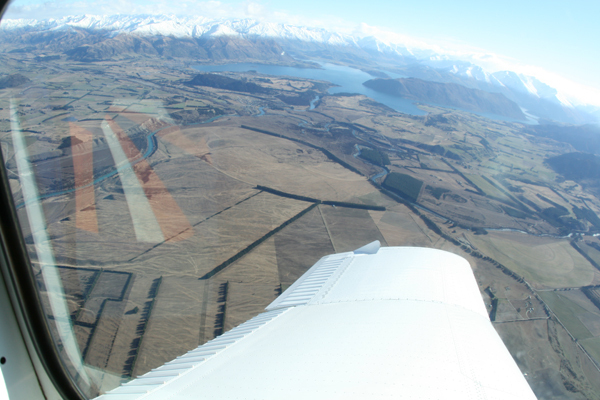 In any case, today’s accident was not a ‘sky diving’ accident – it was a flight accident. Potential for risk and tragedy are present in every choice we make…..even when we choose to cross the road or drive on a highway. Can’t stop living just because of the risk of death! 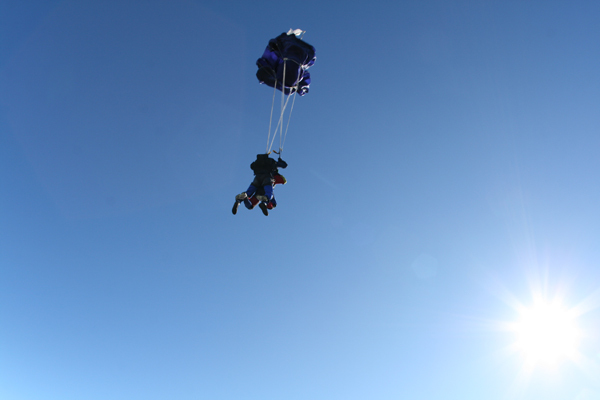 and so, I will certainly go back for more skydiving someday…. You could use the “FOLLOW WOVENSOULS” button on the home page. Cheers! 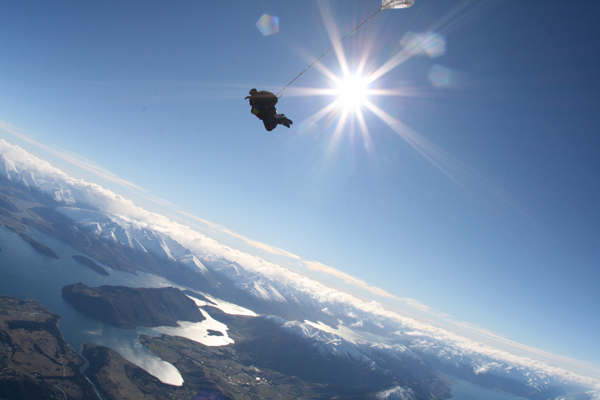 This entry was posted on November 16, 2011 by wovensouls in Thought Kaleidoscope and tagged adrenalin, adventure, Christchurch, crash, experience, fear, fly, free, Free fall, fun, Lake Wanaka, mountains, New Zealand, parachute, Parachuting, plane, plane crash, Recreation, sky, Skydiving, South Island, sports, tandem, thrill, tragedy.